Site of January's hostage crisis and murder of 4 Jews to reopen with new staff, renovations just two months after heinous attack. 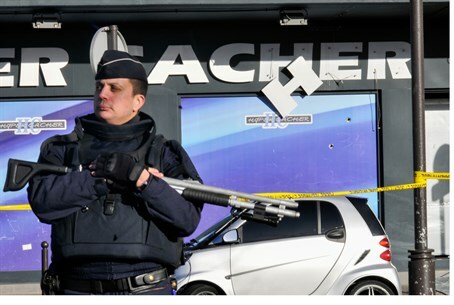 The Hyper Cacher Jewish supermarket in Paris that became the site of a bloody hostage drama during a jihadist attack in January will re-open Sunday, a management source stated to AFP Friday. The kosher shop has been fully renovated and will re-open with new staff, the source said. The Hyper Cacher store on the eastern edge of Paris was badly damaged during the attack on January 9, when jihadist Amedy Coulibaly murdered four Jewish hostages before he was shot dead when police stormed the building. His assault came two days after two other jihadists killed 12 people at the offices of the Charlie Hebdo magazine. In France, home to Europe's largest Jewish community, estimated at up to 600,000, many are considering leaving as the number of anti-Semitic attacks mounts. France has been named as the West's most dangerous country for Jews, and anti-Semitism doubled there in 2014.